One of the marketing difficulties in selling cars must be maintaining the artificial price differentiation between various trim levels. I mean, it would take a lot of convincing before you believed that, say, a V6 Holden Calais at $47,780 actually cost $16,600 more to build than a V6 Commodore Executive. But that 53 per cent pricing premium is what you'll pay to have a Calais in your garage impressing the neighbours, rather than be driving only the base model. But both cars share nearly all of their important bits! At least on test here we have the supercharged Calais, which at $48,830 has both some more in-cabin bits-and-pieces and also the forced-induction engine. For if you regard the supercharged Calais as a fair dinkum [non-Australian readers: translation supplied by email on request] luxury car, you're sure to be a little disconcerted by the impact harshness of the 55-series tyres, the threshing of the engine at high rpm, and the whine of the supercharger at all full-throttle revs. Holden may make very convincing large and cheap family sedans and wagons, but unless 'big' and 'rear wheel drive' are critical elements in your purchase decision, the Calais must be regarded as a much more dubious proposition. Curiously, the Berlina wagon that we swapped for the Calais had both a better ride (probably related directly to the taller 65-series tyres) and - even more importantly - better steering than the more expensive luxury model. 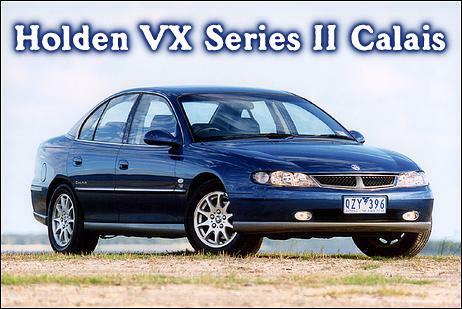 The Calais features the Bosch Variotronic steering, which is obviously regarded by Holden as a premium car fitment. However, it makes the steering eerily light at low speeds, without discernibly improving feel or directivity at higher speeds. In fact, the weight of the steering for a given application is - initially, at least - a driver lucky dip; whether it will be feather light or require a meaty input is something that takes some getting used to. We assume that market research has indicated that prestige buyers prefer steering that in some situations is very light, however many very expensive and well-credentialed Europeans don't take this approach at all. And the ride? The 55-series tyres we found a little harsh, especially on sudden impacts of the sort found where concrete slabs are joined on freeways or where filler strips have been placed across bitumen. However, on larger bumps, the suspension showed the same remarkable composure and compliance that we experienced on bad roads in the Berlina. Note that the extra rear suspension links and the revised damping and sway bar diameters - all part of the new suspension package for the Series II VX - do markedly improve the suspension over previous models. While the ride may suffer, the benefit of the 225/55 tyres on 16 x 7 alloy rims is much better grip, and here the Calais is very competent. It has an excellent turn-in, while with the standard traction control limiting any rear-wheel lateral movement under power, the car in normal conditions is a very safe neutral-to-understeer device. Switch off the traction control and the Calais still remains very good in the handling department, but now with optional power oversteer being available. Curiously, the traction control doesn't appear to work nearly as well with the supercharged engine (and 55-series tyres) as on the lower spec naturally aspirated Berlina, where it was both more subtle and also allowed some rear lateral movement before progressively shutting down the power. The same apparent mis-match also applies to the cruise control, which was far smoother in its operation on the naturally aspirated V6 than the supercharged engine. Perhaps neither system has been recalibrated for the supercharged V6? If you're the sort of person who is prepared to trade off some ride for handling prowess, and who likes bulk bottom-end torque and rarely reves the engine hard, then the Calais provides that mixture. But, on the other hand, if you like sporting and free-revving engines and a suspension that is superbly absorbing of all road imperfections, the Calais will not suit at all. So if the Berlina is a proposition with a better ride and NVH suppression, what exactly does the Calais have that the cheaper car misses out on? When the superfluous badging and cosmetics are stripped away, just a few things. The Calais gets colour-keyed (to the outside paint!) leather seats and door trims, twin climate control (the temp is individually adjustable for both front seat occupants), those bigger wheels and tyres, a boot-mounted 10-CD disc changer together with a slightly upgraded sound system, front foglights and of course the supercharged engine. A sunroof isn't standard. The 3.8-litre pushrod six is equipped with an Eaton positive displacement supercharger. While the power gain over the naturally aspirated version is a modest 12.5 per cent, the increase in torque is much more substantial at 23 per cent. And not only is there a lot more torque, but its peak also occurs 600 rpm lower. So with 375Nm at 3000 rpm and an auto-only trans, the Calais is quite quick around town. Nought to 100 comes up in the low 8-second bracket. But the low-revving engine is best at part throttle and low revs, where it feels strong and reasonably refined. Rev the engine out and it is l-o-u-d - and not with a nice note, either! Rather than the just-detectible whistle that you'll find in a luxury turbo car, the supercharger under the bonnet of the Calais shrieks loudly - if the gearbox made such a noise it would be completely unacceptable, but apparently a whining blower is OK! There is also a significant fuel consumption penalty with the supercharged engine - in the AS2877 government test, the city figure is 13 litres/100km for the blown engine, while for the NA engine it's 11.5. We recorded 14.0 litres per 100km over a wide mixture of country secondary roads, freeways and urban driving - compare that with 12 litres/100km for the 3.8-litre wagon that we recently tested. To a degree the supercharged V6 has in recent times lost its place in the Holden scheme of things - the 5.7-litre Gen III V8 is a hugely superior engine (in NVH as well as performance) and for many, the fuel consumption and noise trade-offs involved in spec'ing the supercharged version of the V6 - rather than the naturally aspirated V6 - will be unacceptable. So that's the engine and the ride and handling - what of the rest of the car? As with any VT-onwards Commodore, there is an enormous amount of room in both the front and the back seats. The seats are softer than in lower-spec models but still do a good job of support, with numerous electric adjustments on both front pews. The three-window trip computer is as good as it is in all Commodores that feature the design, while the rest of the instrumentation and controls are clear and easy to use. The revised VX Series II steering column stalks are a welcome improvement of the previous sharp-edged designs, and there are few interior features that work poorly or are of low quality. So where does that leave the blown Calais? In past tests we have been lukewarm about both the Statesman and now, with this test, the Calais. And yet we've loved the SS and thought the Berlina a very good car. Isn't there a contradiction there? It's our belief that the Berlina trim level represents the natural peak to the big car range - spend more and you're starting to waste your money. Spend less, and you can get a bargain. The VX Series II Calais was provided for this test by Holden Ltd.